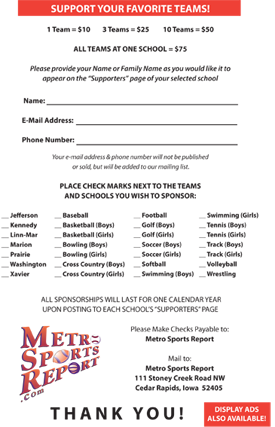 Friends and family members are invited to sponsor a team, teams or a whole school with your financial support for the work of the Metro Sports Report Team! Your name or family name will be posted on the appropriate schools' sponsorship page for a full calendar year from the date your sponsorship is posted. Use this form to sponsor your team or school today!